All Blessings will be leading a team to serve in Guatemala from November 16-23, 2011. The team will be serving in a number of different ministries including the Casa Bernabe orphanage, the HANDS OF HOPE bed building project, and Bible teaching/community outreach with Art and Lisa Camarena, missionaries with Ambassadors for Jesus Christ. Our team will also be honoring Ben Keenan, a passionate man of God who led numerous trips to Guatemala and was dearly loved by the Guatemalan people. Ben received his heavenly reward when he passed into eternity this July. We will be serving in Guatemala this fall in his memory. The trip cost is $2,000. The cost includes airfare, housing, food, transportation, insurance and outreach materials. The funds can be raised through All Blessings Intl, and all gifts are tax-deductible. 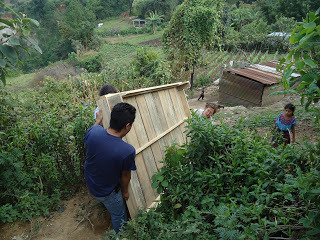 To see photos and read about the Guatemala trip last fall, visit our blog archives in October, 2010. Please contact Jenni Ramsey at jenni.ramsey@cox.net for more information about the November, 2011 trip. We are accepting team member applications now.